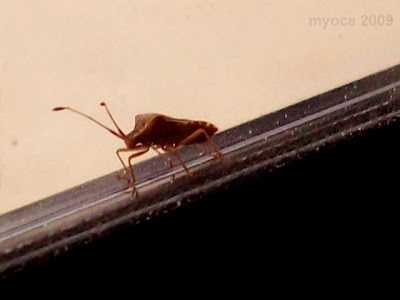 Seems like bugs like to bug me........anyway, they don't "bug" me. 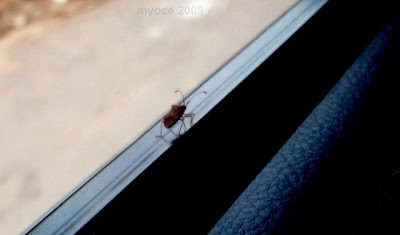 One escorted me some way to work one morning, don't ask me what kind of bug it is^^ If you are squeamish...skip this post,Ok ! I've had that happen before. 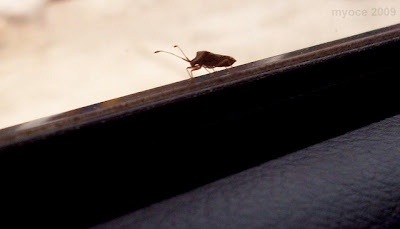 What a lazy hitchhiker! LOL! Looks like visitors who visit us each spring and fall here. One or two always stop by to rest a while, then continue migration. Pretty red stripe, yes? Ha ha ha Tamar, I hadn't thought of it like that !! 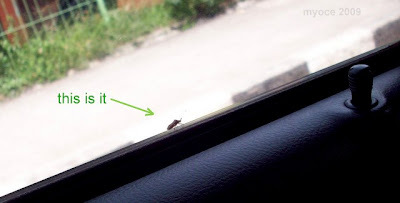 Usually a mosquito hitchhikes inside, and takes a few bites out of me ...sob sob. Oh dear....Siver Bronze, I didn't scrutinize it more closely...the closer the ... err...ickier.. for cowardly me. [I'll leave it for my dad who's an entomologist, only he specializes in termites...]. Heo Young Saeng - here's lookin' at you, girl ! Kim Hyun Joong, in Macau - envy envy....? SS501's Q-licious Kyu Jong !